@fredwilson have you ever told the story of your profile pic? The answer is yes I have but it was eight years ago. I thought it would be fun to re-run that post. 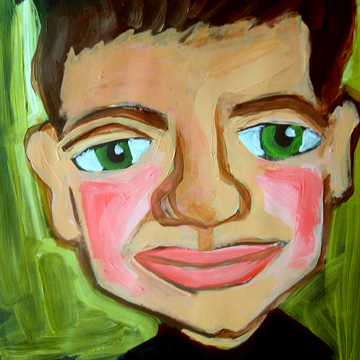 hey @fredwilson – whats the story behind ur avatar? While longtime readers know it, I figure many of you don’t. So here it goes. Starting about four years ago, Howard Lindzon started commenting actively on this blog. He was funny, he was smart, and I enjoyed our banter in the comments. One march vacation, our family made a short stop in Phoenix, where Howard used to live. He emailed me and offered my son and me two tickets to the Suns game. We took him up on that and that’s how we met for the first time. It turned out Howard was hatching an idea for a web show for investors. Think Rocketboom meets Jim Cramer. I told him it was a good idea and encouraged him to do it. Howard would fire ideas at me and I would give him feedback on them. Out of that came Wallstrip. Here’s a post I wrote a little over three years ago announcing the launch of Wallstrip. One of the original ideas for the show that never really worked out was that there would be a dozen well known bloggers who would write short posts about each daily show. Howard asked me to do that and I agree to do it at least once a week. So that’s how the avatar came to be. Howard asked his friend Jenny Ignaszewski to draw up avatars for all dozen of the stock bloggers using photos of them that were available on the web. The first time I saw my avatar was when Wallstrip launched and there it was along with Howard’s and a bunch of others. From the minute I saw it, I liked it. It uses my favorite color (green) as the backdrop and the eye color (my eyes are sometimes blue and sometimes green and sometimes something else). It looks like me, but not too much. So I began to use it a bit here and there around the web as I set up new profiles. But by no means was it the only profile picture I used. For corporate oriented services like LinkedIn, I’d use my Union Square Ventures headshot. For social nets like Facebook, I’d use a regular headshot. I used a photo of me taking a photo on Flickr for a long time. But then I started to realize that the Wallstrip avatar was becoming my online identity. People would comment about it all the time. Around the time we sold Wallstrip, Howard asked Jenny to do a real painting of it which I now have in my office at Union Square Ventures. It’s a real conversation starter. Sometime in early 2008, I just decided to go with it everywhere. It’s at the top of this blog and everywhere else I have an online identity. It’s my online brand now. Like this blog, this was not planned. It just happened. That’s the way most of the important things in my life have come to be.